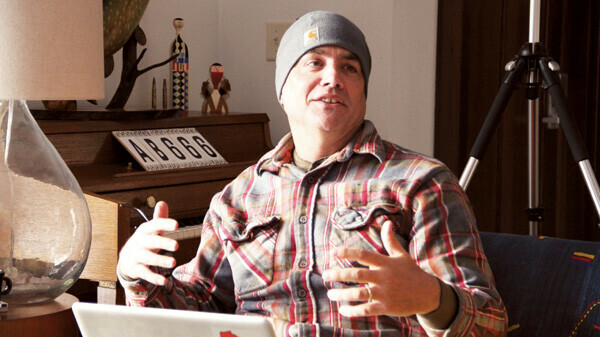 Michael Perry talks about the Eaux Claires festival back in February. Wednesday on Wisconsin Public Radio's Central Time, local New York Times bestselling author (and noted chicken enthusiast) Michael Perry talked about July's Eaux Claires Music & Arts Festival. Perry talks about his role as "narrator" of the festival, the diversity of the lineup, and a few of the Wisconsin/Minnesota bands on the bill. They even touch on some of the family-friendly plans for the festival. "The nice thing is there are already music festivals happening in the Chippewa Valley, there are other people who have gone before us and laid the ground work." The hosts mention the economic impact of a music and arts festival like Eaux Claires, and then they ask Perry about the potential cultural impact to an area, to which he replies, "The nice thing is there are already music festivals happening in the Chippewa Valley, there are other people who have gone before us and laid the ground work and the template. I mean. the very grounds – it's the same grounds as the folks who do Country JAM … and so we always try to tip our cap to those folks, too. They've gone ahead and they've already made this an area that's known for music festivals. We're just adding one that's got a little different flavor." Here, as in other interviews, it's really great to see Eaux Claires organizers acknowledging what's already been built in the area. Early in the interview, Perry mentions, "It's fun to introduce the nation to the Chippewa Valley."